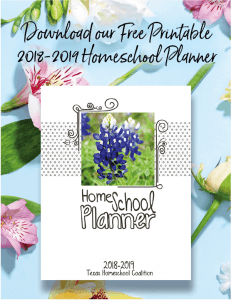 As we begin the year 2016, I am reminded of the ongoing battle to protect home school families and parental rights in Texas. Over two years ago the Tutt family was ripped apart by an unelected judge issuing an order to remove their children with no evidence of abuse or neglect, much less evidence required by law that the children were in imminent physical danger. The caseworker in this case has testified under oath in two court hearings that she knew the children were not in danger but chose to falsify an affidavit to justify the judge’s order to have CPS remove the children. Only an infographic can demonstrate and help one fully understand the struggle and timeline of the Tutt family. After two years of litigation to restore the family, one child still remains in foster care in spite of a legal requirement that CPS finish its actions involving families within one year, with a six-month extension allowed. That child was six years of age when this began and is now eight and has missed two birthdays, Thanksgivings, and Christmases with her family. Another of the Tutt’s children is now also running into complications with Medicaid. Despite a serious situation that requires immediate medical attention, Medicaid has told the family that their child’s account is on hold because CPS is still listed as the conservator–despite the Tutts having been granted full conservatorship over their child over two years ago, and despite an order for CPS to fix this Medicaid issue over a year ago before it became the time-sensitive matter that it is now. Read a complete presentation of the Tutt case. The Tutt’s case is pending at the Texas Supreme Court with full briefings requested by the court and completed in October. Within days of the filing of those briefings, CPS initiated a new investigation of Mrs. Tutt based on an alleged “outcry” by the young child still in foster care. Since the Tutts no longer live in the Dallas area, their new local CPS office was required to open an investigation even though it took weeks before the caseworker received the recording of the interview in which the child allegedly made this outcry. THSC Special Counsel for CPS issues, attorney Chris Branson of Houston, was retained by THSC to represent Mrs. Tutt in this investigation. After an aggressive defense of Mrs. Tutt, the local attorney representing CPS directed the case to be closed. Austin Attorney Cecelia Wood, who has represented the Tutts in the case, says that this is the most egregious case of CPS abuse that she has ever seen in almost 30 years of practice. The Tutts are contemplating a civil action against the CPS caseworker who has caused great harm to the children and this family. Especially for the child still in foster care. For the child needing immediate medical care. For the Texas Supreme Court to render a decision to end this travesty for this dear family. For THSC’s ability to continue covering the legal fees for this family. For justice to be done in the legal action against CPS. 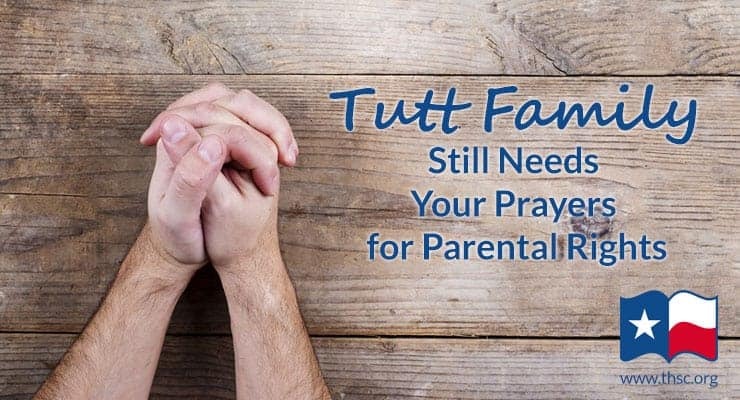 Please consider contributing to the Parental Rights Litigation Fund (PRLF) to support the Tutts. Keep informed on updates on the Tutt family and other issues impacting Texas families by signing up for email notifications. Please share this information with your family and friends via email, Facebook, Twitter, and in any other way you know how. This family needs your support! Tim, I am just horrified for these precious children and their parents! I have been following this case. I will continue to pray for this family. May God continue to give them great strength and protection. My heart aches for them. I have heard it alleged that the children were abused while in CPS custody. Is this true? These children are have been undergoing counseling and therapy resulting from their time in foster care.